The phone call came in May 1993. Lisa Keller had no idea who the caller was, but she liked what Terri Pauls was saying. The 16th annual Alaska Women's Run was fast approaching and Keller, one of the city's top runners, had already decided to skip the popular race. Like many women, she wasn't happy with race organizers, who had raised entry fees, eliminated prizes and other perks, and wouldn't say where its proceeds went. Pauls wanted to provide women with a choice — a new all-women run. To make it work, she believed she needed the support of top runners like Keller. The phone conversation was part of a whirlwind three weeks during which Pauls, sensing unrest among runners but rejecting suggestions of boycotts, created the Anchorage Run for Women. On Saturday, some 5,000 women and girls will gather at Anchorage Football Stadium for the 25th running of the race, now known as the Alaska Run for Women. In 25 years, it has raised more than $4 million for the fight against breast cancer — a fundraising component integral to the event's inception and its success. Pink-clad runners and walkers will raise their arms in triumph or hold hands in solidarity as they cross the finish line. They will do yoga before the race and Zumba after it, they will mourn friends and relatives lost to breast cancer and support those who are fighting it. They will revel in a unity and energy no other athletic event in Anchorage can rival. And to think this celebration of sisterhood is rooted in revolt. "The rebel race at Westchester Lagoon" is how Lupe Marroquin remembers the first Run for Women. "We were all sort of jubilant: 'We are the rebel race!' People were wearing bibs from the other race, including me," said Marroquin, who has served as the race's director of ambience since the beginning. Race day was the culmination of three weeks of grass-roots organizing by Pauls and three weeks of drama played out in daily newspaper headlines. 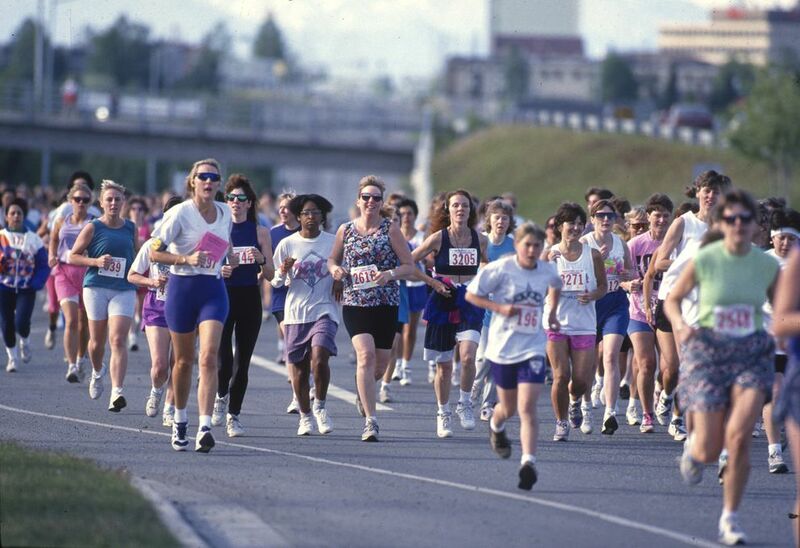 A relative newcomer to Anchorage at the time, Pauls was compelled to do something after reading an Anchorage Daily News column that suggested women either boycott the Women's Run or run as bandits, the label given to runners who don't pay entry fees but participate anyway. "Those seemed like negative responses to me, and a friend of mine suggested we just create our own run," Pauls said this week by email. "But I needed to find out what the top women runners in the state thought, so I called them. They wanted to meet with the race director of the Women's Run to ask for some improvements. When he declined to meet with them, most of them strongly supported an alternative run." When it was later learned that Women's Run race director Larry Ross was drawing a sizable salary, support grew stronger. 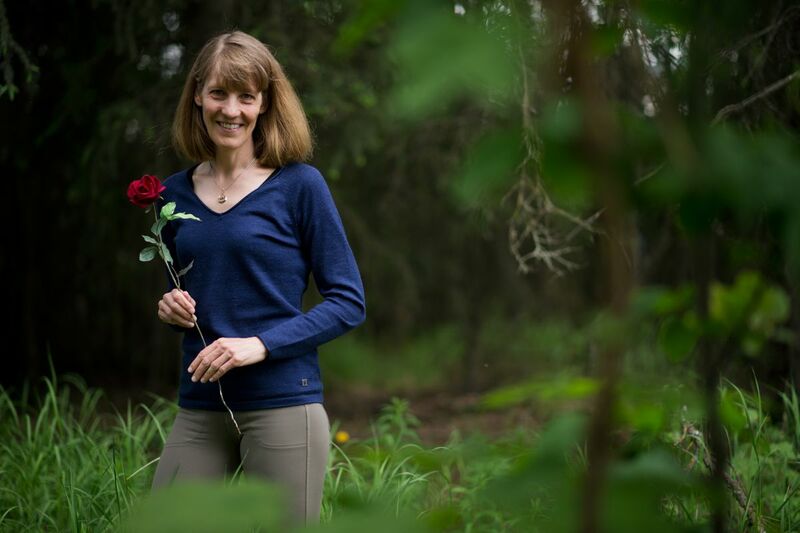 "Most people never realized that it was for-profit or this guy was getting paid," said Kathy Wistoff, who in 1993 co-owned the Alaska Athletic Club with her husband, Jay, and became one of the original sponsors of the Run for Women. "Once it became public, that's when the defection started. "… People were up in arms about it." As things continued to heat up, Roland Gower, an Anchorage surgeon whose patients included women with breast cancer, wrote a letter to the editor. He suggested the Women's Run consider making a donation to the fight against breast cancer. "There was a feeling on my part that there was sort of an exploitation of women as a group because (race organizers) wanted to be the biggest and the best in the United States and they were raising a lot of money, but where was it going?" Gower said. "… I saw a lot of women that were upset by this, and if you get women organized, they do something. The two runs were scheduled for the same morning, and as race day approached it was clear the affection once felt for the Alaska Women's Run was waning. The 1992 race had attracted a record field of 3,448. 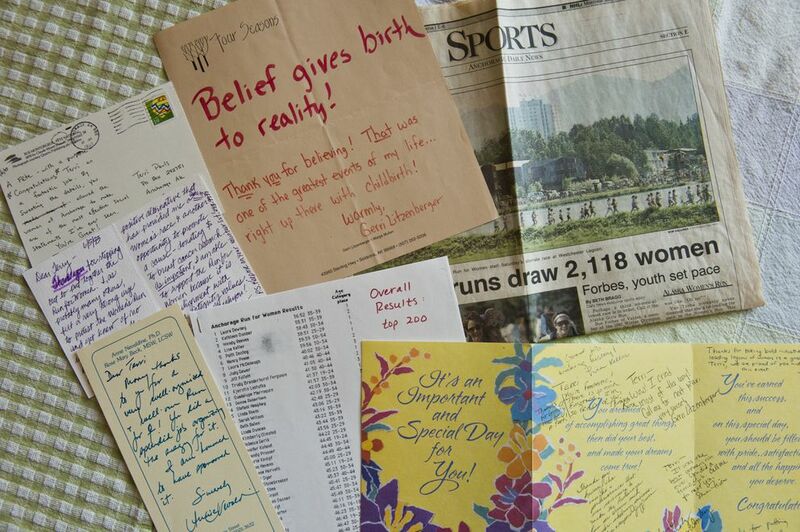 In 1993, citing the loss of a major sponsor, race organizers increased entry fees and eliminated a number of frills — among them, age-group prizes, training T-shirts and a post-race awards ceremony. The $20 entry fee made the 16th annual Women's Run the most expensive race in town. Only 1,700 girls and women signed up — half the number of the previous year. Then, on the day before the dueling races, came another headline. The Daily News reported that, according to the race's tax forms, Women's Run race director Larry Ross was drawing an annual salary of $24,000 to put on a race with an annual budget of $100,000. "All these things were cut back, we were told, because there was no money," Keller said. "… Then, when the tax returns were revealed, it was, 'Oh, so this was about preserving your salary …' "
At West High the next morning, about 350 of the runners who had signed up in advance for the Women's Run were no-shows. Meanwhile, a mile or so away at Westchester Lagoon, the new race was swamped by last-minute signups. About 250 people had signed up in advance and another 500 showed up the morning of the race, for a total of 758 participants. "It was thrilling to see so many women and girls show up at the last minute," Pauls said. "Many came down the bike path from West High … I didn't want anyone to be left out, so I delayed the start by 15 minutes." Keller, who finished fourth in the inaugural race (Laura Downey was the winner), was surprised by the turnout. Less than two months later, the Alaska Women's Run's all-male board of directors voted to end its event. For a decade, the Alaska Women's Run invited runners with world-class or national-class resumes to Anchorage to headline the race. In 10 of the 11 races prior to 1993, the winner was an Outside runner. The race will raise money for a cause that benefits women. And it will put the spotlight on Alaska runners. "That has been our mission statement right from the start," Wistoff said. "And the fact we wanted it all to be volunteer. We tried not to spend any money at all. We were so frugal. As the race got bigger and bigger, we had to start spending money on things — police, barriers. (But) we still beg before we pay for anything." The reason is simple. The Run for Women is a benefit for breast cancer, and every penny not spent on the race itself is another penny for the fight against breast cancer. One of the first decisions Pauls made was to not charge an entry fee. Instead, women would be asked to make a donation that would benefit breast cancer research and related causes. That first year, the average donation was just over $20, she said. Of the more than $4 million raised over the years, $1.2 million has been spent on mammograms for Alaskans who otherwise would not be able to afford them, said race committee member Nance Larson. That works out to more than 3,100 mammograms in 24 years. Gower believes the race has saved lives. "I still believe that early diagnosis is one of the most important things for curing it, and (the race) has made a significant contribution in the number of women who are screened in this community," he said. 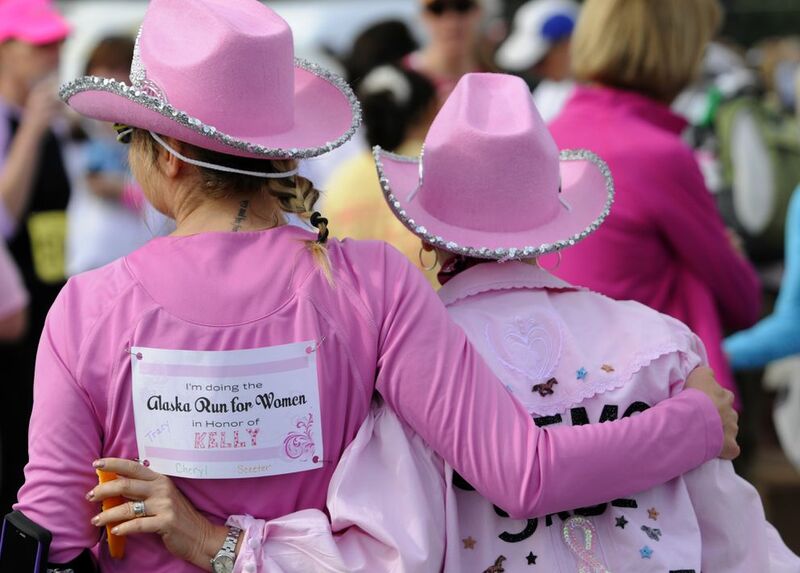 The breast cancer connection makes the Alaska Run for Women the pinkest race you're likely to see. Pink has come to symbolize the fight against breast cancer, and from winners to back-of-the-packers, pink is everywhere on race day. The Run for Women is one of the biggest all-women runs in the country based on registration totals. It often makes the top 10 of Running USA's list of the country's biggest women-only races. Each year, the field includes a couple of hundred women who wear the pink hats that designate them as survivors. Each year, girls and women pin cards on the backs of their T-shirts with the names of loved ones who have died from or are fighting the disease. "When I see the back tags, it always makes me tear up. When I see women dressed up in their pink whatever, holding hands or linking arms or coming across the finish line as a team, it chokes me up," Wistoff said. Said Marroquin, "When it's over, I just have to drive somewhere and cry." At the 20th edition of the race, Gower was asked to be the official starter. "It's one of the most emotional things I think I've done," he said. "… I think there were close to 300 survivors that year, and 30 or 40 of them were my patients." In 2003, Keller joined the pink-hat brigade. "After the 2002 race, I was diagnosed. I found my lump a week after the race," she said. "I feel like this race will never let me go, and that's not a bad thing. So it's become a huge part of my life." A couple of years ago, Pauls was back on the phone with Keller. She had recently received her own diagnosis of breast cancer. "I called … and asked, 'Guess what?' She guessed correctly, and then said, 'Welcome to the sisterhood,' " Pauls said. The 2015 race was Pauls' first as a survivor, and the occasion gave her pause. "The most emotional moment for me was at the University Center (registration), when a friend who's a 20-year survivor of breast cancer handed me my pink hat," Pauls said. "At that moment, the connection between me founding the run and now personally being part of the cause really hit home. "At the run itself, it really helped to sense all that support. It helped me move from disbelief to reality. It may sound trite, but I think women really do feel stronger together."